Wusthof retains the forged construction that's a trademark of that company, with one piece blade, bolster and rat tail tang handle. The steel in this blade is the same as in the rest of Wusthof's knives, designed for tough edges that don't chip and are easily sharpened. The resulting cutting edge has a thicker bevel than the usual Japanese version but is more durable. If kept razor sharp it will do excellent work. The multiple hollows of the granton grind reduce friction as the blade cuts. Slices of food usually fall away from the blade rather than stacking up and rolling away. If you are used to the curved edge of a chef's knife you may find the santoku a little strange at first, but many of the habits left over from that other style work equally well with this straighter blade. 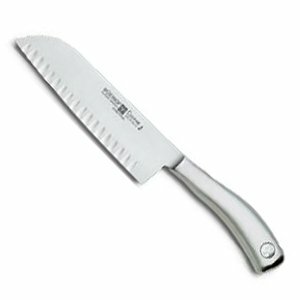 The satin finish stainless steel handle is accurately fitted against the bolster and held securely in place by a stainless steel rivet embossed with the Wusthof Trident, making this a fine knife for presentation as well as prep. Couple of issues with this article. The Culinar series of knives do not have rat tail tangs. the tails extend throughout the handle. A rat tail tang is not a welcome feature in a knife that will see heavy use. Rat tail tangs end someplace towards the middle of the knife which given frequent use by chefs or home enthusiasts will result in a pressure point that will eventually give way and cause the knife handle to break. Also, the handle is not secured to the tail of the blade by a rivet covered by the Wusthof logo. The Wusthof logo on these knives are small emblems that are placed in an indentation designed in the handles. Their is not rivet under them.